The establishment of Regional Development Agency “Zlatibor” was based on identified needs of municipalities from Zlatibor region, trough transformation of Regional Centre for Small and Medium-sized Enterprises and Entrepreneurs “Zlatibor”. 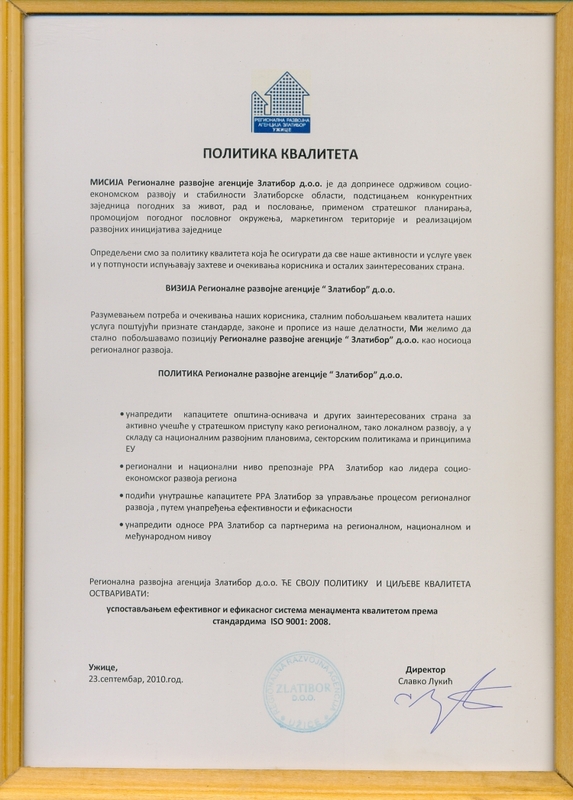 The establishment of The Regional Centre for Development of Small and Medium Enterprises and entrepreneurship “ Zlatibor”, ltd( hereinafter RC) is result of wide initiative of European Union aimed to support the development of private sector and SME in Serbia, through the project:”Non-financial support to development of SME sector in Serbia”, implemented by European Agency for Reconstruction. RC was founded on October 22nd 2002..The founders of RC are: Serbian Government, Municipality of Uzice, Regional Chamber of Commerce, Association of the Entrepreneurs of Uzice, Vojvodjanska Bank joint stock co. Novi Sad, Alpha Bank Belgrade.